This is a beautiful Retro steel blue 1953 Crosley in classic automotive styling. The radio is playing nicely, picking up all my local AM stations clearly. The chassis has been recapped by a pro, so it should perform well for many months to come. The case is in excellent cosmetic condition, no cracks, breaks, scratches or other cosmetic issues. These radios usually have tarnished metal trim pieces, but the metal trim on this radio is in pretty nice condition. 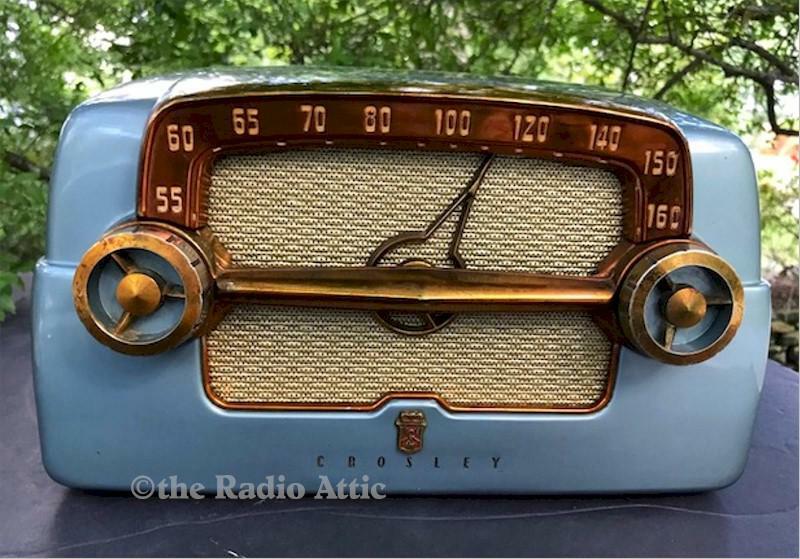 This is an excellent example of a radio that is an icon of the early 1950's, in a color you don't see very often. About 12"W x 7"H x 7"D.
You are visitor number 586 to this page.